I’d like to think that our meetup group always has a great turnout because the people are cool – and not just because there’s usually pizza and beer 😉 I first met Dallas Gutauckis when he attended our meetup after moving to NYC a while ago. It was the first time I heard about SeatGeek and the cool stuff they were doing in the event ticketing space. It’s no surprise that Dallas went on to speak at the first Droidcon NYC about Android animations. When he reached out about hosting a meetup at SeatGeek, how could we say no? Sandwiches, foxy pillows, balloons, and snazzy lounge chairs greeted 150 meetup members when they disembarked from the elevator. After the usual drinks and chit chat, we buckled down to learn about advanced RxJava and Conductor. Watch his talk below at the 3:37 mark. Watch both talks below, many thanks to SeatGeek for recording the audio and slides! See you next month at Button! For April, we welcomed Vimeo to our family of awesome meetup hosts! We thoroughly enjoyed their space, swanky arm chairs, and of course, sandwiches and pizza. Be sure to check out their Android app, DayTripper, which came out of a recent hackathon. Kyle Venn from the Vimeo team talked about ExoPlayer 2.0. When asked about tips for our group, Kyle suggested: “Number one tip: make sure you understand how ExoPlayer works before trying to customize it (or even before using it). If you don’t need ExoPlayer’s customizability, then maybe MediaPlayer is better fit. If you decide that ExoPlayer is right for the job, be careful not to only copy and paste code from the official sample app. I’d highly suggest thinking through the architecture of your use case beforehand and understanding what each piece of the ExoPlayer initialization code does. The second tip would be to look at the issue tracker on the ExoPlayer GitHub since it’s an amazing resource for learning more about the library.” Check out Kyle’s slides and watch his talk down below. Join the lint-dev group here! Read the Android source for great examples! Thanks to Michael, Kate, Gabriella, and Melissa for helping us coordinate. See you next month at SeatGeek! 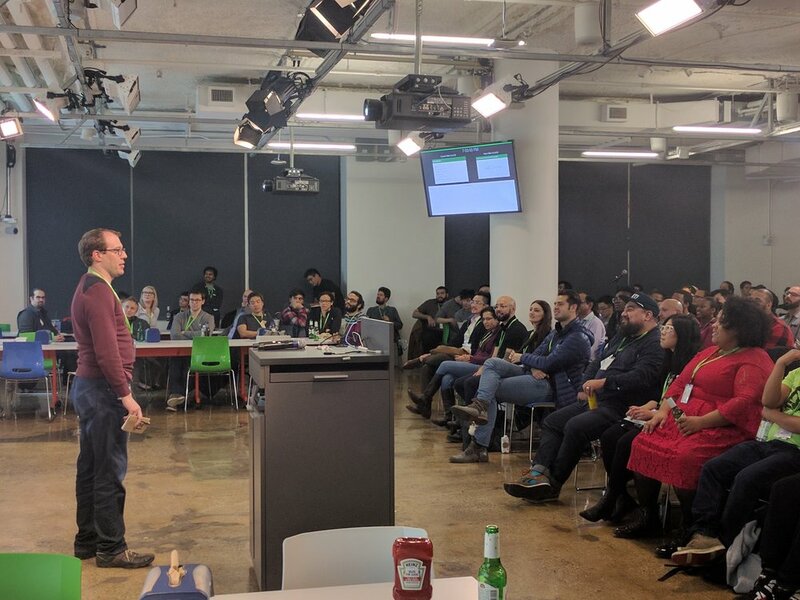 For our last meetup of the winter, we headed to Facebook NY to learn from Tom Wilson (Blue Apron) and Jason Sendros (Facebook). The Facebook recruiting team were amazing as usual and treated our group to pizza, beer, and plenty of refreshments from their impressive refrigerator in the event room. Kang Zhang (Instagram) welcomed the group on behalf of our sponsor before Kevin introduced Tom to kick off talks. Many thanks to the Facebook AV team for recording the talks and Q&A!. See you all next month at Vimeo on April 19th! 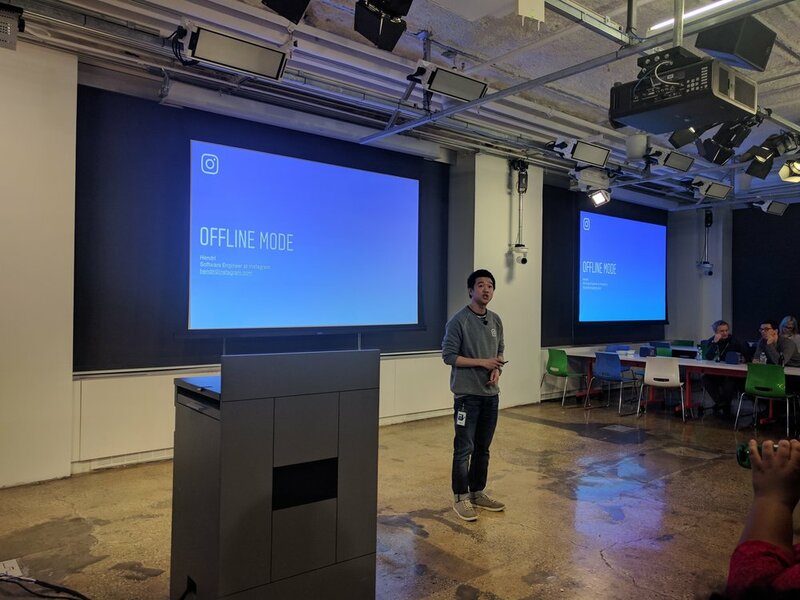 The American Express headquarters may seem far to some, but it was no big deal for the 100+ developers who came out for our February meetup. We helped ourselves to pizza and refreshments before kicking back and relaxing in the cushy auditorium. 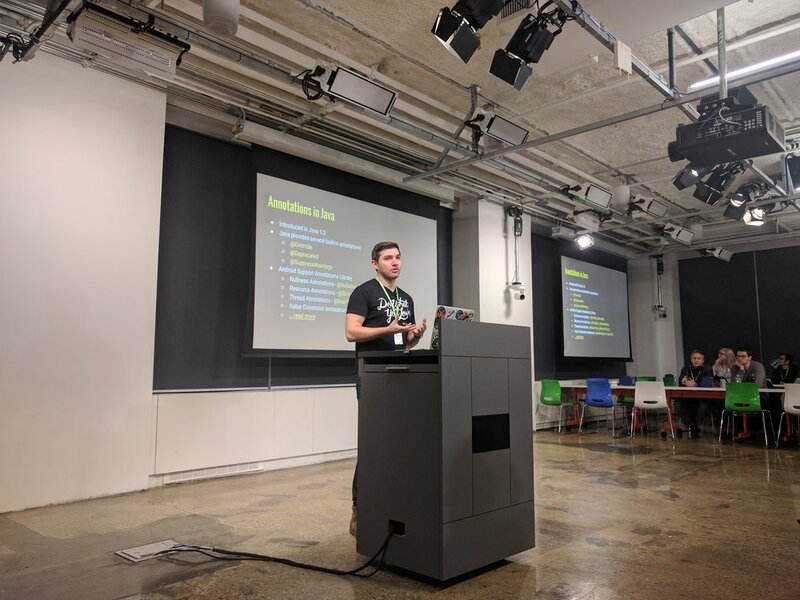 Andrew Orobator presented his talk, “The Guide to Becoming a Well-Rounded Android Developer.” He shared his thoughts on what it takes to become a well-rounded Android developer, revealing productivity tips, UX advice, and more. Andrew advises, “My one takeaway for boosting Android Productivity is to optimize the hot path. If you recognize yourself doing the same task over and over, see if you can find a way to make that task more efficient.” His slides can be found here. After the exciting talks, those with energy left to Lily O’Brien’s for the afterparty. I personally was beat and headed home – but got to stroll through the amazing Oculus for the first time! We’ve always had great turnouts for our meetups, but our most recent one drew an official headcount of 204 members! Maybe it was the talks, smooth check-in process, or maybe even the pizza? Whatever it was, thanks for helping us ring in a new year of meetups with a spectacular crowd! The recorded meetup is now up on the touchlab channel, so check them out if you couldn’t join us. Read on for Ben, Igor and Hendri’s tips for the group below, along with links to their slides (if provided). Ben’s tip for Fingerprint Authentication, slides here. Igor’s tip for Annotations, slides here.